Power generators can be a lifeline for you and your family in the event you experience a blackout. Properly maintaining your generator is vital to ensuring that it works when you need it. Improper usage of a generator can lead to it malfunctioning or worse, causing a fire and putting your family in danger. By following some simple steps, your generator should be able to provide you with the safety and power security you need during a power outage. Note: Be sure to read the product manual provided by the manufacturer before starting your generator, and keep the document stored in a safe place so that you can easily access the information should you need it. 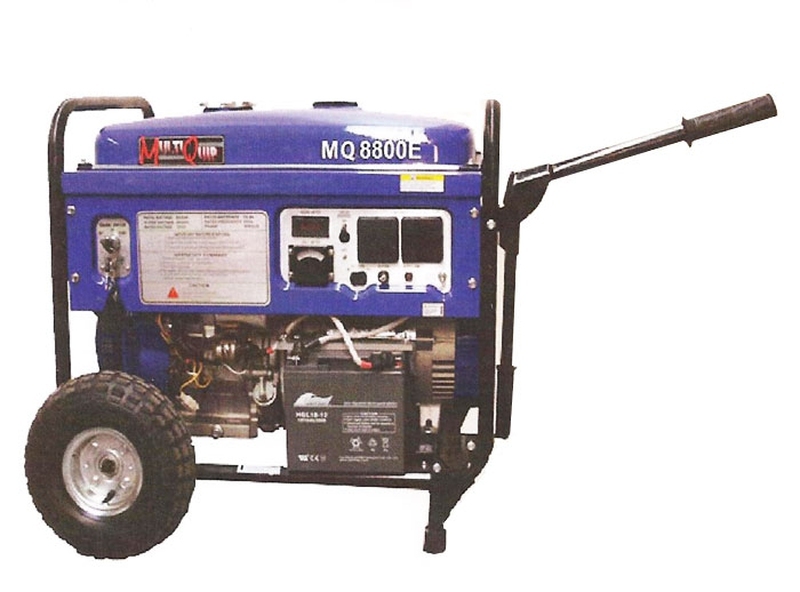 Your portable generator runs on fuel and it’s necessary to ensure that the tank is kept full. The full line in the tank is typically about an inch from top. Do not put any extra fuel in the generator tank. This could lead to fuel spillage and cause an accidental fire. Your generator also needs oil to run. Be sure the oil is at an optimal level by lifting the off cap. The dipstick which is used to measure the oil level is connected to the cap. Wipe off the dipstick with an old cloth. Place the dipstick back into the tank and remove it. Check the gauge to verify that the oil is at a proper level. If necessary, pour in more oil to fill the tank. Be sure to determine from your product guide the correct type of oil you need before putting it in the tank. It’s a good idea to keep an extra container of oil in the event you need it during an emergency. Never run your generator in your home! Push your generator into an outdoor area that is well-ventilated and make sure the exhaust pipe is pointed in a direction away from your home. The fact that your generator is outside does not prevent fumes from getting into your home through windows, doors or exhaust openings. It is vital to ensure that the generator exhaust is located in a dry area at least ten feet from your windows and doors so that it cannot enter your home. This will prevent any chances of carbon monoxide poisoning in your home. It's a wise choice to have a battery-operated carbon monoxide alarm installed in your home. This device will notify you if any CO fumes from your generator do enter your home and put you and your family at risk. Be sure to check the batteries on a regular basis to ensure that the alarm is working properly. Set the fuel valve on your generator to “ON.” This is typically a vertical position on most generators. Next, pull the generator choke to “ON” as well. Finally, press the control “ON” button to start the generator. Once the generator has begun operating, you can release the choke. Plug your devices into an extension cord that is designed for this purpose and that can be used outside. Then, plug the extension cord into the generator. If the power outage is lengthy and you need to refill the fuel tank on your generator, turn off all of the connected devices and then turn off the generator as well. Allow the generator enough time to cool completely before adding more fuel to the tank. Your generator is designed to support a specific number of electric devices. Smaller generators can usually provide around 3,000 watts of power. That amount of wattage would be enough to power a refrigerator, several lights and a fan or two. Trying to power too many devices can lead to fuse problems on the generator and electrical damage to the devices you are attempting to power. You can prevent the chances of this happening by ensuring that you are following the directions provided by the manufacturer and connecting only your essential items during a power outage. Non-essential appliances should be left off until the power outage is over. It’s important to keep your generator well-maintained in order for it to operate properly during a blackout. Turn on your generator once a month for about ten minutes to check that it is running as it should be. Your generator should be placed in a safe area outside while you check it. Ensure that you have an electrical appliance connected to it while it is running. If necessary, fill the tank with fuel and make sure that the oil is at its proper level as well. When you are sure that your generator is operating properly, place it back in its normal storage space. Store the fuel for your generator in a proper safety container. Be sure that the fuel container is placed in an area away from your living space. Server responsed at: 04/19/2019 8:45 a.m.